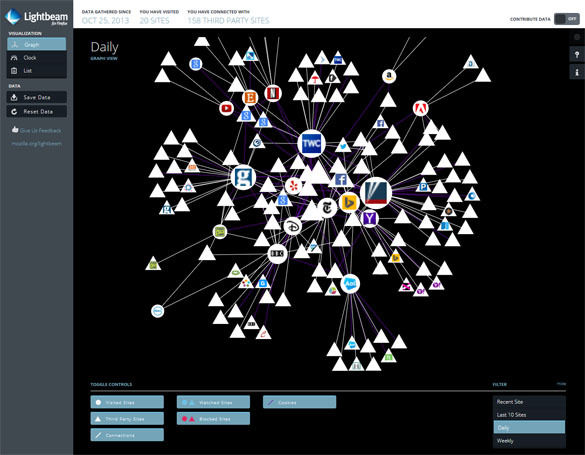 I have just downloaded and taken a quick look at the new Mozilla add-on called Lightbeam. I am an UBUNTU user myself, so I don’t know if this will work for other systems, but I would like you to help me decide if it’s an interesting tool either way. I have always heard that companies share your information. So you go on one site and they share your habits with other organizations. 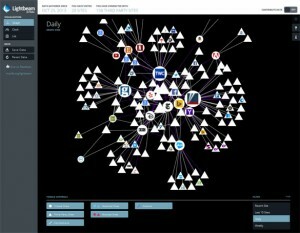 Well Lightbeam shows you who they are sharing your information with. One thing that I should say is that I do not know what the information they are sharing actually is. If anyone does know I would love to hear. So that is job number one for you down in the comments below. The actual view that you are presented with when you open this program is very nice. A series of connected triangles that drift around the screen, all tied together like one of those kinnect toys that my kids play with. Some of the triangles have website logos on them, others are blank. It’s almost a snowdrop kind of effect. And it makes a nice little educational game. As you visit another site it joins the page with its connections, the entity wobbles and bounces before coming static. Many of these connections are the same, creating a central mass, but some sites do not share with anyone that the others do, and live in their own little detached bubble. I was surprised to find that ebay UK is not connected to any of the other sites. It has 3 satellite sites but they are all ebay subsections. I would have to draw the conclusion that ebay do not share your information. Job number 2, correct me in the comments below please. The Weather channel divulge to another weather channel and 3 or 4 others, CNN and the BBC are about the same. TECHNOLOGY BLOGGERS DOES NOT SHARE WITH ANYONE! Read it and weep and respect where it is due Christopher. My employer the Bassetti Foundation are linked to Twitter, and nobody else. Oh and guess who is in the middle of the blob, tentacles everywhere, yes of course, Facebook. I have not visited the site but they appear through the mist to take centre stage. No wonder profits are up! Without understanding more this add on is just a toy to me, but I am sure if I was a bit more savvy it could give me a lot of insight into the dark and murky workings of the web. I think it might also present an opportunity, as we can now see who is prostituting our information and who is not, and maybe we should put more trust in those that keep our data in their own hands, and some others a little less. Definitely worth a look I would say. Is updating Java really important? What do you know about Java? If the answer is not much, then you are not alone. In this article I am going to explore exactly what Java is, and why it is so important that you keep it up to date. It is possible for someone to gain access to your computer via Java. All you would need to do is visit a website with malicious Java code on it, and unknowingly to you, you could be being hacked. Some websites allow you to add your own code to their site, (like forum’s for example) so it might not even be a malicious website you are visiting, just one page which contains malicious code. When you visit a page with a malicious Java application, your browser will usually start to run the code, which will open up a direct link between your PC and the hacker – remember browsing the net is a two way process, every time you request data from a server, the server can request something back. On face value, a page with malicious Java could look completely normal and trustworthy, as you wouldn’t be able to see the code – your browser would render it for you. Malicious code can give a hacker almost complete access to your machine, via the internet. They could potentially browse through your files and open applications, and even receive feedback from input devices like a webcam and microphone. When Sun Microsystems (who are now owned by Oracle) developed Java, they didn’t plan for it to be used maliciously, and still don’t. Like with most code, hackers exploit loopholes and flaws in the language, to enable them to perform malicious activity. Like with any software, to combat malicious activity, when flaws are discovered, developers create patches and launch new versions to protect uses against their installation being misused. Many of the know ways Java can be used to gain access to your computer are preventable, if you have the latest version installed. It is important that you not only keep your computers version of Java up to date, but also your browser’s version. Many browsers come with a Java plugin, and this can become outdated, even if your system version of Java is up to date. You should check to see if your browser’s extensions and plugins are up to date ideally once every week. If you have Premier IT Support, or your computer is updated by an external provider, you shouldn’t need to update Java, as that should be taken of care for you. This post was going to be entitled “Why you should stop using Internet Explorer” however I didn’t think that was a strong enough title, so I changed it to the direct instruction you see above this text: Stop using Internet Explorer. You have a choice. You can use Google, Bing, Yahoo! or Ask. You can buy Windows, Mac OS, Chrome OS or Ubuntu. You can go with Apple, Samsung, Sony or RIM. Although Google dominate the search market, there are still many other search engines out there. Microsoft dominate the computer market, but you can still choose from a [reasonable] selection of other, popular operating systems. You could argue that Samsung now dominate the global smartphone market, but there are still many other companies you can go to to get a smartphone. You also have a choice as to what browser you use. The internet is arguably now the main function for any computer, so surely you should devote some time then to choosing which browser is right for you? If you have tried more than three different browsers before, for a considerable length of time and have after weighing up all the pros and cons of each, have chosen your favourite, well done you. If you haven’t, read on. If you are using Microsoft Internet Explorer (IE), stop. Okay, well you can finish reading the article, but then stop using it. A simple instruction, which could do wonders for your internet experience. There are many reasons not to use IE. Here is a list of what I think are the strongest arguments against the heavy, slow and outdated browser. IE seems to constantly be in the news for its security issues. Much of the malware out there on the internet is only made possible by bugs and holes in Internet Explorer! Need proof? Check out this section of IE’s Wikipedia page. In recent years Microsoft have been really working on making Internet Explorer faster, and IE 9 is much faster than IE 6 or 7 were; granted. That said, it is still much slower than the competition. For example, loading Technology Bloggers from cold (hard refresh) in Firefox, Chrome and Safari took 3 seconds, Opera took 4, while Internet Explorer took 7 seconds. Without a doubt, for features, add-ons and extensions, Firefox and Chrome are miles out in front. Safari and Opera also have a reasonable number of things you can add to your browser to customise/improve it, but Internet Explorer has only really started to embrace such features since IE 8. Apart from toolbars, Flash, Adobe Reader etc. IE 6 didn’t really do add-ons. How IE rendered the same code (our social buttons) on three separate page loads – neither is correct. Take a look at the three images to the right. Each of the images is a different variation of the social buttons on our sidebar that IE rendered. The screen size remained the same, and the loads were seconds apart. IE managed to render three completely different versions of the same code. How does that work? In the first image it didn’t even attempt to load the social buttons before declaring it was finished. It took a better shot in the second image, whilst in the third image it didn’t bother loading Twitter and threw Google+ to the bottom. Why? Upon loading the blog in Firefox, Chrome, Safari and Opera, I saw the exact same result. Each browser displayed them as they are meant to be displayed, every time – Internet Expolorer didn’t. Code is advancing all the time, and a good browser will keep up to date with changes, and make sure it is able to interpret and display modern CSS, HTML, PHP etc. When the blog snows at Christmas, IE doesn’t show that, IE also doesn’t like the ‘modern’ code which makes our search box work, or the code we use to add shadows to text. IE 9 doesn’t work with Windows XP, or any Mac OS or Linux system. Only Vista, 7 and 8 support IE 9. 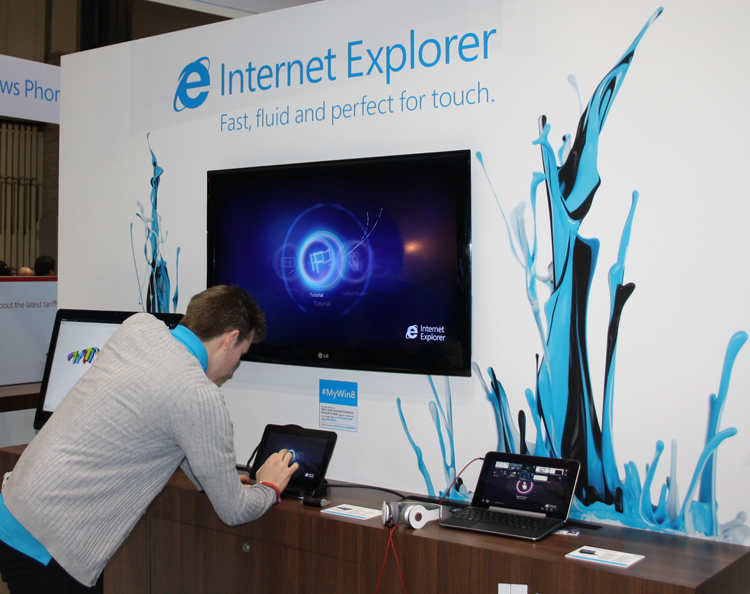 IE 10 only works with Windows 7 and Windows 8. According to StatCounter, in the last 6 months, 26.55% of all computer users used XP, whilst 7.13% used Vista and 7.46% use MacOSX – that’s 41.14% of the market that Microsoft are isolating straight away, and Windows 7 and 8 don’t even own all of the 58.86% share of the market that is left! Microsoft have recently undergone a quite extensive advertising campaign for IE, to try and shake off its bad reputation. They state how ‘lightning fast’ it is compared to how it used to be, which I can’t dispute. What they don’t however say is how it compares to Chrome or Opera. They also try to reassure users that it is now secure, although that is still debatable! There are loads of web browsers out there, check out this handy Wikipedia comparison table to see. 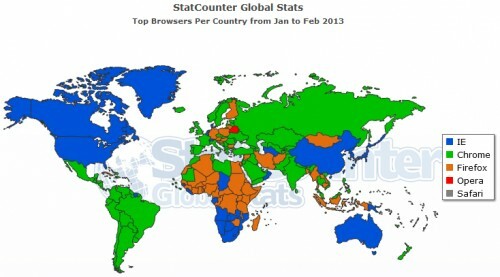 Below is a map showing in 2013 so far, which internet browser is the most commonly used by country. Browser popularity by country. The colour of the country is the colour of the most used browser – see legend. Personally I would advise using either Chrome or Firefox. If you have a relatively standard, or slow PC, then Chrome is probably best for you. It is light, simple and fast. I still think that Firefox had more functionality than Chrome, and it is my personal favourite. If your PC is usually pretty quick and of a reasonable spec, then I would recommend Firefox. Chrome is owned by Google – a multinational corporate giant – whilst Firefox is non-profit and open source.